Innovas recently commissioned Helios Tube Cleaning Systems at Memorial Hospital of South Bend, servicing eight Trane chillers, including four new 900-ton chillers and retrofits to four existing chillers. 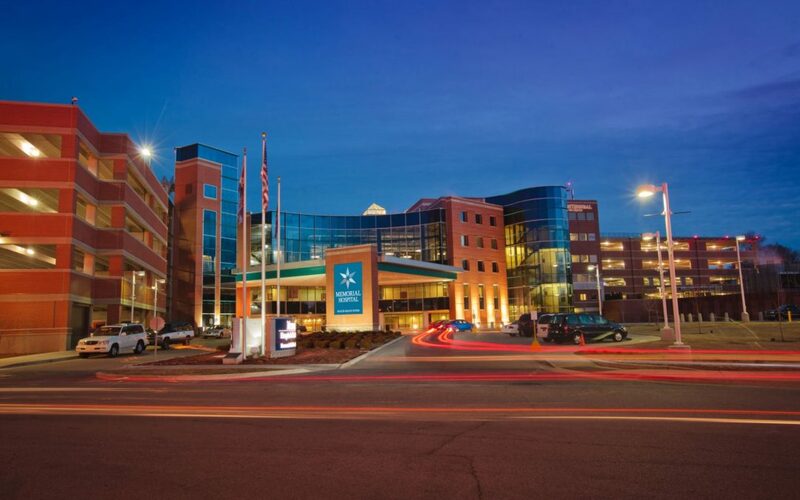 The chilled water plant provides more than 5,600 tons of cooling capacity for Memoral Hospital of South Bend and the adjacent Memorial Children’s Hospital. As part of the chilled water plant expansion and upgrade project, geothermal capability was added to the energy center, allowing the chillers to utilize either ground source cooling or existing cooling towers. This enables the facility to leverage the local groundwater cooling source and greatly reduce chilled water plant energy consumption. As pictured above, the four new Trane 900-ton chillers are serviced by a single Helios TCS skid, with each chiller having an independent collector and ball trap. The chillers are equipped with head pressure control and variable condenser water flow to enable the use of geothermal cooling from local groundwater. Accordingly, the Helios TCS controls were integrated with the building automation system (BAS) and chiller controls to ensure coordinated chiller and Helios TCS operation. In the existing mechanical room, a second Helios TCS skid was installed as part of the project and services the four existing chillers. Two 900-ton Trane centrifugal chillers and two 140-ton Trane screw chillers were retrofit with independent collectors and ball traps. 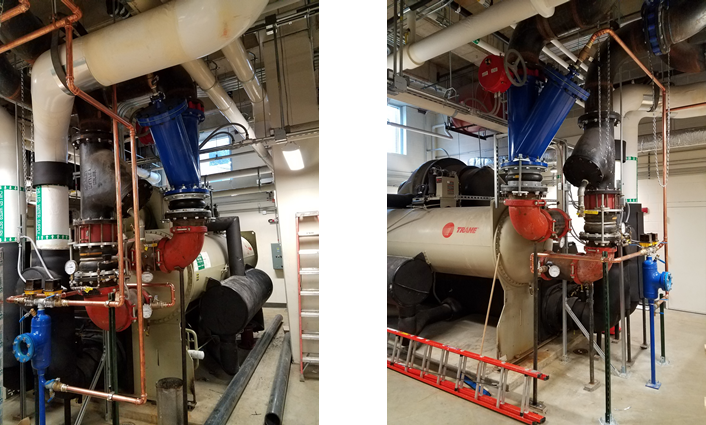 Geothermal cooling capability was added to these chillers as part of the chilled water plant expansion project. The project was engineered by Heapy Engineering of Dayton, OH with general construction management and oversight by Balfour Beatty Construction, and the Helios TCS were bundled with chillers supplied by Solid Blend Technologies and Trane of South Bend. Close coordination and communication by all parties involved was a crucial component in this incredibly successful project.